Mr Moonshine, who looked a chaser to follow after two runaway successes at Carlisle and Haydock earlier in the season, is an intended runner in the £23,500 Grade Two totepool.com Towton Novices’ Chase (2.15pm) at Wetherby this Saturday, February 4, Totepool Irish Day, according to trainer Sue Smith. The eight-year-old also ran a cracking race when stepping out of novice company in the Grade Two Peterborough Chase at Huntingdon on December 8, when he finished third behind Gauvain and subsequent Grade One winner Somersby. However, he failed to shine last time out behind Grands Crus in the Grade One Feltham Novices’ Chase at Kempton Park on Boxing Day. Smith, who trains at High Eldwick near Bingley in West Yorkshire, said: “Mr Moonshine is likely to run in the totepool.com Towton Novices’ Chase. He went a bit too quickly early on at Kempton in the Feltham, but since then he has been in really good order. “I don’t think the ground overly bothers the horse. He handles soft ground - not a bog, but he handles most ground and is pretty versatile. 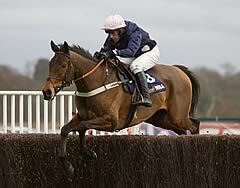 There are 17 entries for the totepool.com Towton Novices’ Chase, which is run over three miles and a furlong. Nicky Henderson could be represented by high-class novice hurdler Mossley, who won easily on debut at Kempton in November before finding Join Together too good at Cheltenham the following month. He could also saddle Cucumber Run, who beat Mac Aeda at Wetherby on January 23 over an extended two and a half miles, but he will be tackling three miles for the first time. Helpston, who stepped out of novice company to finish a gallant second to According To Pete in the £40,000 Grade Three Betfair. Don’t Settle For Less Rowland Meyrick Handicap Chase at Wetherby on Boxing Day, is on course to return to the West Yorkshire venue according to the eight-year-old’s owner, trainer and breeder Pam Sly. 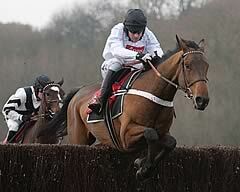 The Cambridgeshire-based handler said: “The plan is for Helpston to run in the totepool.com Towton Novices’ Chase. “He has been fine since the Rowland Meyrick. I did have him in the Sky Bet Chase, but because he has not had a lot of racing I’m erring on the side of caution, and going the novice route. “I was delighted with his run in the Rowland Meyrick - I thought Gina Andrews gave him a great ride considering she had never sat on him before and Phil Smith, the handicapper, said that if she had got after him a bit earlier he probably would have won. That was only his sixth start over fences. The form of the Grade Three Betfair. Don’t Settle For Less Rowland Meyrick Handicap Chase has been boosted by the winner According To Pete who has since triumphed in the Grade Two Peter Marsh Chase at Haydock Park. Helpston will be aiming to add his name to the Towton’s roll of honour which also features 1997 Betfred Cheltenham Gold Cup winner Mr Mulligan, who won at Wetherby the previous year. Champion trainer Paul Nicholls has entered Picture This, who is part-owned by Sir Alex Ferguson, after the nine-year-old made a winning reappearance after a 443-day absence at Folkestone on January 2. Rebecca Curtis could rely on Teaforthree, who had progressed nicely over fences prior to pulling up in the Feltham Novices’ Chase last time, while William Amos has entered Lie Forrit, who won on his December chase debut at Kelso before finishing second back at the Borders track behind Bold Sir Brian. Bold Sir Brian is one of two possible representatives for Lucinda Russell, who could also saddle Blenheim Brook, an impressive winner over three miles at Newcastle in December, while Alan King could run Iron Chancellor, a winner at Southwell on January 4. Ian Williams, who has been responsible for the last two winners of the totepool.com Towton Novices’ Chase, could bid for a third consecutive success with Baile Anrai, who has won his last two chase starts decisively after falling on his chase debut at Wincanton. Williams trained the 2010 winner Weird Al, who returned to Wetherby at the beginning of this season with a victory on his debut for Donald McCain in the Grade Two Bet365 Charlie Hall Chase, while Wayward Prince was successful for the trainer in 2011. Malcolm Jefferson has entered Mac Aeda, and three-time chase winner The Panama Kid, while Ann Hamilton could saddle Rolecarr, successful in two chases. The entries are completed by Ikorodu Road, Carrickboy and Maringo Bay. 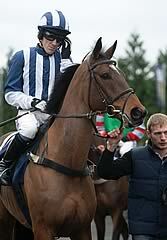 The totepool.com Towton Chase’s roll of honour features 1997 Betfred Cheltenham Gold Cup winner Mr Mulligan, who won at Wetherby the season before his famous success in Jump racing’s Blue Riband. Other notable winners include subsequent Welsh National scorer Halcon Genelardais in 2006 and the year before Ollie Magern, who captured two Charlie Hall Chases in 2005 and 2007. Totepool Irish Day kicks off at 1.10pm with the H A Fox Jaguar Leeds Handicap Hurdle (1.10pm, 25 entries), the Play totescoop6 At totepool.com Today Handicap Hurdle (1.45pm, 22 entries), the totepool Mobile Text Tote to 89660 Novices’ Hurdle (2.50pm, 36 entries), the Bet totepool Text Tote to 89660 Handicap Chase (3.25pm, 18 entries), the Wilmot-Smith Memorial Cup Hunters’ Chase (3.55pm, 15 entries) and the wetherbyracing.co.uk Standard Open National Hunt Flat Race (4.25pm, 26 entries). Gates open at 10.40am and the public marquee facility in the Paddock Enclosure will feature an Irish band and dancers plus traditional Irish Fare, including Guinness, of course! A special offer 'Irish Experience' package is available. Priced at £21.50, the Irish Experience includes Paddock Enclosure admission, a racecard voucher, a pint of Guinness, beef with Guinness gravy and champ mash, plus a £2 Tote discount bet voucher.